I like Constant Mists in these kinds of decks. The decks that are planning to win with combat damage often just fold to that one. Patron of the Moon and Meloku the Clouded Mirror might be other worthwhile additions? I'd also look into some mana sinks. I mean there has to be a point where you have enough mana and you might want to start spending it on something to actually win the game, right? 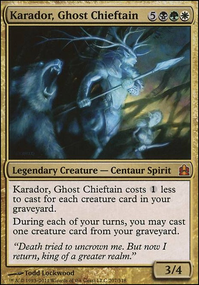 :) I run buyback spells (Wurmcalling) in my Karametra deck, which I'm guessing works somewhat similarly to this one. Soul of Zendikar, Nemata, Grove Guardian... Something like those, perhaps? Laboratory Maniac looks a bit strange in this deck. Has it been working for you? Dragonlord Dromoka could help protect the combo a bit if necessary, and is just a good card to run in general. 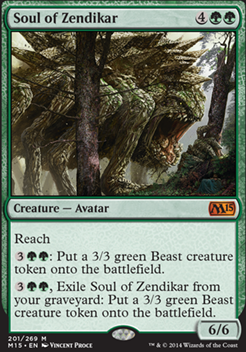 Soul of Zendikar / Nemata, Grove Guardian / Urbis Protector creates infinite tokens. Carnivorous Moss-Beast creates an infinitely big creature. For what I can tell, without using Auratouched Mage to fetch Boonweaver combo (which, with the other combo, takes up a whole lot of deck space), there is no way to instantly win the game w/out other included cards. Enlarge, Fade into Antiquity, Lost in the Woods, Coldsteel Heart, Phytoburst, Aspect of Hydra, Howl of the Night Pack, Soul of the Harvest, Soul of Zendikar, and all of the spells that do nothing but gain you life can go. Naturalize is a must. Rampant Growth, Kodama's Reach, and Cultivate are all good ramp. Overrun can be a game-ender. Harmonize is good card draw. Fyndhorn Elves and Elvish Mystic are essentially extra copies of Llanowar Elves. 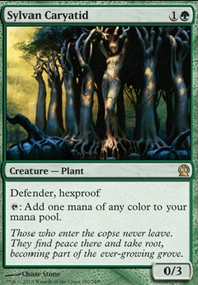 In this deck, so is Arbor Elf. You also might want to consider some utility lands, like Oran-Rief, the Vastwood or Blighted Woodland. There's also a bunch of good stuff coming in Core 2019 that you might want to check out. Okay. Sorry I'm late, so I'll make it a good one. Group hug-ish: Akroan Horse, Alliance of Arms, Sylvan Offering. 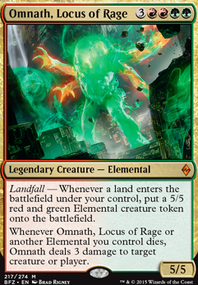 Matchup-Dependent: Eyes of the Wisent, Fresh Meat (after a wrath), Hellion Eruption, Kazuul, Tyrant of the Cliffs, Luminarch Ascension, Night Soil, Phyrexian Rebirth. 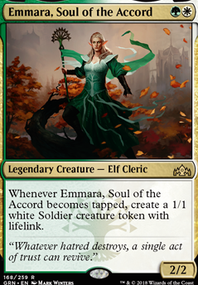 Maybe too expensive: Ant Queen, Deploy to the Front, Devout Invocation, Elspeth, Sun's Champion, Ezuri's Predation, Godsire, Soul of Zendikar. Maybe too slow: Assemble the Legion, Awakening Zone, Dragonlair Spider, Elspeth, Knight-Errant, Freyalise, Llanowar's Fury, From Beyond, Growing Ranks, Imperious Perfect, Jade Mage, Kazandu Tuskcaller, Krenko, Mob Boss, Rakka Mar, Vitu-Ghazi Guildmage. Awesome: Artifact Mutation, Aura Mutation, Baloth Cage Trap, Brimaz, King of Oreskos, Hanweir Garrison, Hero of Bladehold, Martial Coup, Nomads' Assembly, Oketra the True, Sacred Mesa, Sram's Expertise, Sundering Growth, Tempt with Vengeance, Tilonalli's Summoner, Trostani, Selesnya's Voice. So yeah. Quite a list eh? Had to comb through 660 cards. So like... there's a lot. Ruthless Knave has to have a way to go infinite with Training Grounds but I'm not sure how. Magus of the Coffers goes infinite even without Training Grounds, but grounds does make it even better. Same with Palinchron. Deadeye Plunderers + Training Grounds + Parallel Lives + Marrionette master is infinite damage. 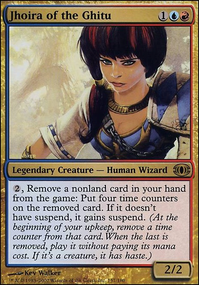 Replace Parallel lives with Doubling Season/Primal Vigor, or replace Master with Disciple of the Vault. Deadeye Navigator would go infinite with a creature that produces 2 or more blue mana and a haste enabler, such as Concordant Crossroads. Kind of clunky as a 4-card combo, but it's on theme. ALso deadeye is just good to protect from removal. Also Paradise Mantle + Pili-Pala + Training Grounds is infinite. You can replace Pili-Pala with Knacksaw Clique as well. Remember with these infinite mana combos that infinite mana means infinite Tasigur activations, so you draw your whole deck, and you can mill everyone out with infinite Reality Shifts, which is a good removal spell on its own.